The claims of Bank of Baroda authorities of having water-proof bank lockers at their Sector-22 branch, where a fire broke out on Friday, appear doubtful as many locker holders say they found their articles damaged as water seeped into their lockers. 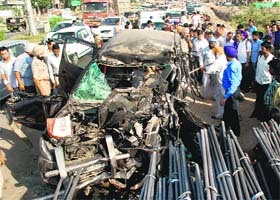 Two persons were killed and four seriously injured in a road accident near Zirakpur on this morning. The accident occurred when a Mahindra Jeep carrying five members of a family returning from Vaishno Devi temple rammed in to a parked truck alongside the Ambala -Chandigarh National Highway near a Best Price store in Zirakpur. 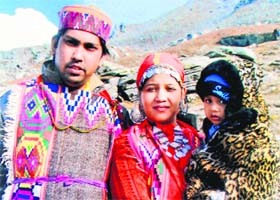 A file photo of deceased Vishnu Gupta with wife Vaneeta Gupta (injured in the accident) and one of the children. Officials at the Registration and Licensing Authority (RLA) paid an excess amount of Rs 10 lakh for the services outsourced by the Chandigarh Administration. 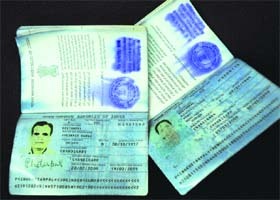 The excess payment was made due to poor maintenance of record at the RLA. If senior officials of Panchkula Police think that Chandigarh is the only place infected by the bug called ‘eve-teasing’, they need to cross-check their facts. 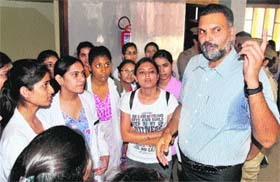 A reality check at four points in the vicinity of Government College, Sector 1, Panchkula, revealed that girls were being teased at will by the eve-teasers. It is really sad and shameful that the cases of eve-teasing and molestation are on the rise in the City Beautiful. Every day, we hear about women and young girls being followed by “loafers", belonging mostly to the student community, who pass lewd remarks at them. They do it so daringly as if there is no law to punish them. 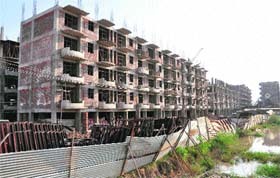 With tenders for 338 two-bedroom flats in one of the blocks at the Sector 63 General Housing Scheme yet to be floated, the Chandigarh Housing Board (CHB) is all set to miss the May, 2013, deadline to complete the project. It is first time in the history of the UT police that two inspectors have been suspended following orders by the Ministry of Home Affairs (MHA). The departmental inquiry against Inspector Amanjot Singh and Inspector Neeraj Sarna will be conducted by SP RS Ghumman. As the city observed Le Corbusier’s birth anniversary yesterday, no special decoration or lighting arrangements were made at the Sector 9 Lily Garden that houses a memorial, dedicated to Pandit Jawaharlal Nehru in 1989, his birth centenary year. The parking facility and green belts in the Phase-VI market continue to be in a poor condition with the Municipal Corporation ignoring the repeated pleas of the shopkeepers. A play capturing the predicaments of bureaucracy is all set to be staged at the Tagore Theatre in Chandigarh on October 12. Directed by Mumbai-based senior theatre director Rahul da Cunha, the play is titled ‘The Bureaucrat’. Panjab University is mulling a proposal to exempt the college teachers from appearing in the entrance for PhD programme. The issue was raised in the Syndicate meeting held on Saturday and it was decided to work out the modalities for the proposal. A seminar on the theme “Nanotechnology in Drug Delivery: Promises and Concerns” is being organised from October 8 to 13 at the University Institute of Pharmaceutical Sciences (UIPS), Panjab University, for the mid-level faculty in pharmaceutical sciences. The Haryana government has sanctioned around Rs 15 crore for the various development works in Kalka and Pinjore area. 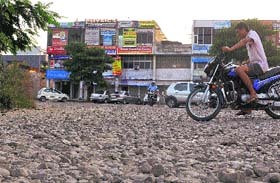 Manveer Kaur Gill, district spokesperson of the Congress and a member of the Shiwalik Development Board, who was here to listen to the grievances of the residents, said Rs 75 lakh would be spent on the maintenance of streets and some other developmental projects. An collage making competition was held at the Longowal Polytechnic College, Dera Bassi, today. Nearly 50 students participated in the competition. The participating students, who were from diverse disciplines, were provided with themes. The National Deaf Lawn Tennis Championship concluded at the NIS Tennis Court, here on Sunday. In the three-game finals of boys' category, L Sai Chandan of Andhra Pradesh defeated Somdutt Sihag of Rajasthan by 6-1 and 6-2 while in the second and third game he defeated Somdutt Sihag and Ankit. A 23-year-old youth was allegedly robbed at gun point in Ram Dabar late last night. The incident took place near 3BRD in Ram Darbar, Phase I. The victim Santosh Kumar told the police that he was walking to the Sector-43 Inter-State Bus Terminus to board a bus to Jammu when a car, with two occupants, stopped near Mauli Jagran and offered him a lift. The police today arrested six persons, including a singer, in two separate cases of theft where expensive equipment, including batteries and wireless sets, were being stolen by the accused, who were also drug addicts. The total value of recovered items in both cases is Rs 10 lakh. Two workers at a jewellery-making unit allegedly stole gold and diamond jewellery worth Rs 25 lakh from the unit in the Phase VIII Industrial Area. 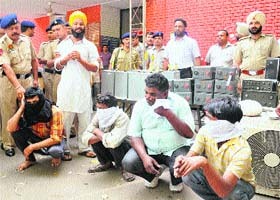 Karanvir Singh, owner of KSG Company, told the police that allegedly two of his employees, Bajrang Lal and Birbal, stole the jewellery. In another development in the ATM theft case, the police has revealed that the youth, who pasted leaves on CCTV cameras installed in the ATM room on the day of theft, had rehearsed four days before finally doing it. The CIA staff of the Mohali police has arrested a youth on the charge of duping innocent people after offering them help to withdraw money from ATMs. SSP Gurpreet Singh Bhullar said the suspect, Nikhil Thakur (20), who had been operating in Mohali, Chandigarh and Dera Bassi, was arrested from Balongi. The Essel Sports Private Limited, Which had launched the Indian Cricket league (ICL), has failed to clear its dues, which were to be paid to the Haryana Urban Development Authority (HUDA), Panchkula, for using Tau Devi Lal Stadium, Sector-3. The amount has risen to Rs 60 lakh now. Tennis players, Aniket, Navjot and Vaibhav stormed into the next round of boys' (u-14) category after registering victories over their opponents during the ongoing Manav Mangal Total Tennis Championship here at Manav Mangal Smart School, Phase-10, today. Boxer Charanpreet Kaur of SGGS for Women, Sector 26, has defeated Ruchi Katoch in the 46 kg category during the ongoing Inter-College Boxing Championship for Women (A-division), which is being held at the Gymnasium Hall of Panjab University, here today. The soccer team of St Soldier School, Sector 28, won the final of the CBSE Cluster XIII Football Trophy after defeating BSF School, Jammu, in a one-sided final here today. 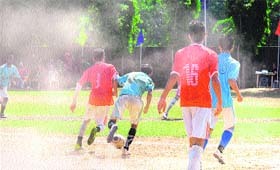 The team registered a convincing victory the score of 5-0 . 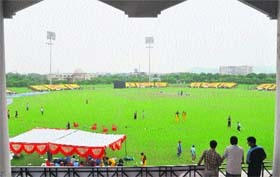 Madhya Pradesh Cricket Association (MPCA) scored 250 runs against Kerala in the third-round clash of the second All-India Invitational Cricket Tournament for Dhruv Pandove Trophy, here at PCA Cricket Stadium, Mohali. The swimmers, representing Panjab University, bagged the overall trophy of the All-India Inter-University Swimming Championship for Men, which was held at Kolkata from October 3 to 7. The team won with a total of 45 points while Bangalore University finished runners-up with 33 points.